The Hispanic electorate has grown in size and importance. Today, the number of Hispanics eligible to vote in the nation’s elections has reached a record 23.7 million, up by more than 4 million since 2008. Overall Hispanics now account for 11% of the nation’s 215 million eligible voters—a new high (Lopez, Motel and Patten, 2012). However, Hispanic participation in the nation’s elections has historically lagged behind that of other groups. This year, the level of participation remains a key unknown about the Latino vote. When it comes to interest in this year’s election, the new survey reveals that 61% of Latino registered voters say they have thought “quite a lot” about the coming presidential election. This is slightly below the level of interest among all registered voters, which stands at 70% (Pew Research Center for the People & the Press, 2012b). Among nearly all subgroups of Hispanic registered voters, majorities say they have given the election “quite a lot of thought,” though some have done so more than others. Three-in-four (76%) Republican Latino registered voters say they have given the coming election “quite a lot of thought,” a higher share than that among Democratic Latino registered voters (60%). Latino registered voters who are foreign born have given the election somewhat more thought than those who are native born—65% versus 60%. Other differences are also evident. Latino registered voters who have less than a high school diploma are less engaged than those who have at least a high school diploma. Fewer than half (44%) of those with less than a high school diploma have given the election “quite a lot of thought,” compared with 60% of high school graduates and 68% of those with at least some college experience. Latino registered voters are less likely than all registered voters to say they’ll vote in this year’s election. Three-in-four (77%) Latino registered voters say they are “absolutely certain” they will vote, while 89% of all registered voters say the same (Pew Research Center for the People & the Press, 2012b). Among Hispanic registered voters, the most likely to say they are “absolutely certain” they will vote in this year’s presidential election are those with at least some college education (85%), those ages 50 to 64 (82%) and those who are English dominant (81%). Meanwhile, Hispanic registered voters who are the least likely to say they are “absolutely certain” they will vote are those who have not completed high school (64%), those who are Spanish dominant (65%) and high school graduates (69%). According to the Pew Hispanic survey, nearly all (97%) Hispanic registered voters say they are confident they have the identification they need to cast a ballot; in the 11 states that require photo identification, 95% of Hispanic registered voters are confident they have the necessary ID. Confidence is equally high among the general public; 98% of all registered voters say they are confident they have the identification they need to vote this year. 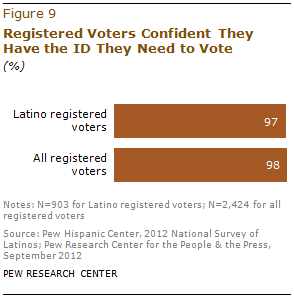 Confidence in having the ID needed to vote is high across all demographic groups of Hispanic registered voters. However, among those who are eligible to vote (an adult U.S. citizen) but are not registered to vote, fewer (87%)—though still a large majority—are confident they have the identification necessary to cast a vote in their states. This finding is reflected in the share of Latinos who say they have a valid state-issued driver’s license or photo identification. Among registered voters, 93% say they have a valid state-issued ID. By contrast, 75% of eligible voters who are not registered say they have a valid state-issued ID. When it comes to Latino attitudes toward voter ID laws, the Pew Hispanic survey finds broad support for these laws, especially among foreign-born Hispanics. Overall, 71% of Hispanic registered voters say voters should be required to show an official identification to be allowed to vote on Election Day. Among the general public, a slightly greater share of registered voters says the same—77%. But among all registered voters, some differences are evident. 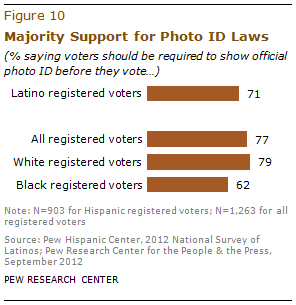 For example, nearly eight-in-ten (79%) white registered voters support photo ID laws. By contrast, a smaller share of black registered voters support such laws—62%. 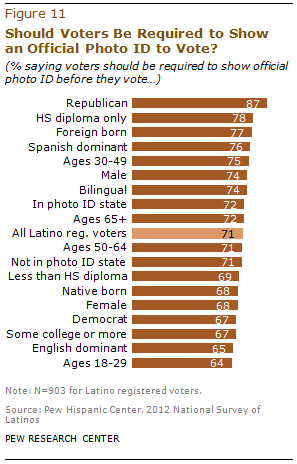 Among Latino registered voters, support for photo ID laws is highest among Republicans (87%), those whose highest educational attainment is a high school diploma (78%) and the foreign born (77%). 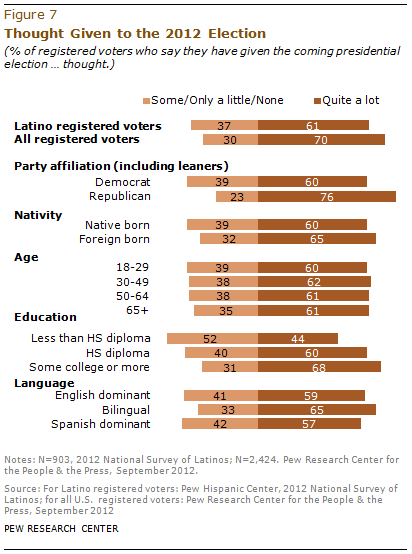 It is lowest among Latino registered voters ages 18 to 29 (64%) and the English dominant (65%). 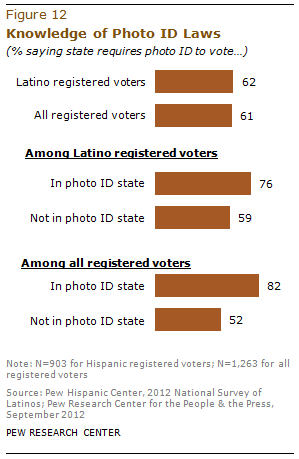 However, across all major demographic groups of Latino registered voters, a majority support photo ID laws. With so much discussion about voter and photo ID laws this year, many Hispanics believe their state requires a photo ID to vote, even if it does not. According to the survey, nearly two-thirds (62%) of Hispanic registered voters say their state requires a photo ID to vote. Among Hispanic registered voters who live in states where a photo ID is required, 76% say their state requires this. Among those who live in non-photo-ID states, 59% say their state requires a photo ID.5 This pattern is similar to that of all registered voters among the general public (Pew Research Center for the People & the Press, 2012a). However, among all registered voters, blacks are more likely than whites to believe their state requires a photo ID to vote—71% versus 58%.